Gene Bryner - one of the most amazing individuals I have ever met, and an outstanding friend, hunter & Alaskan outdoorsman. Gene passed away in July 2006 while training for his next sheep hunt. I will remember him always and treasure the moments we spent together in Alaska's backcountry - hunting, fishing, and just hiking. 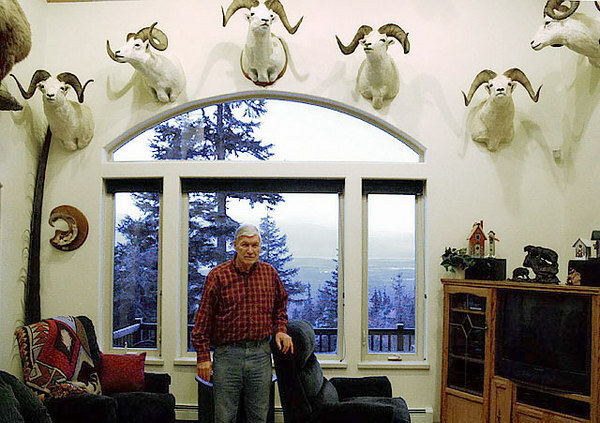 Gene was a sheep hunter, as you can tell by his trophy room. I hunted several times with Gene, and though we never killed any sheep together, we had some great and memorable hunts. I'll see you again someday, Gene, in that Great Land beyond the sky.